Skoda’s latest SUV – the Karoq – has been whipped into a specifically fleet-focused model for company car drivers. Available now with a P11d price of £20,660, the Karoq SE Technology takes the SE trim and bolts on a raft of fancy extras in a bid to wow business customers. Things like front and rear parking sensors, panoramic sunroof and LED daytime running lights come as standard on the SE Tech model already, as does adaptive cruise control. However, the SE Technology adds various driver assistance systems and enhanced connectivity. This means it comes with the more advanced eight-inch Amundsen touchscreen sat-nav, which is packed with European mapping, voice control and integrated Wi-Fi. Drivers can connect their smartphone to the infotainment system with ease thanks to Smartlink+ that pairs with Apple CarPlay and Android Auto. The Karoq also offers wireless charging and a fancy feature that boosts phone signal for improved communication on the move. There are also the usual clever touches that we’ve come to expect from Skoda, such as the ice scraper in the fuel cap, umbrella under the passenger seat, removable LED torch and handy storage compartments in the boot. Buyers will be able to choose between four engines – two petrol and two diesel – with power outputs ranging from 113bhp to 148bhp. All four are available with seven-speed DSG transmission as an option, and the 2.0 TDI diesel engine has four-wheel drive. The most powerful petrol model – the 1.5 TSI 148bhp DSG – boasts a P11D of £23,310 and 24 per cent benefit in kind. 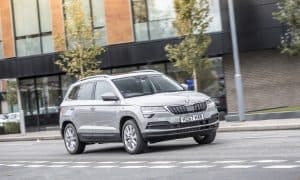 Henry Williams, head of fleet for Skoda UK, commented: “The Karoq is a much-anticipated addition to our all-new SUV family that began last year with the seven-seat Kodiaq.